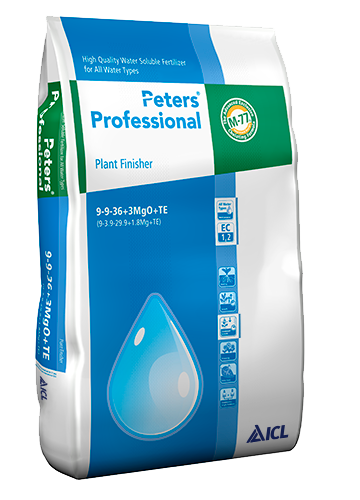 Peters Professional Grow-Mix contains NPK with relatively low levels of phosphate. A well-balanced N:K ratio makes this product suitable for growth stimulation. A large proportion of the nitrogen part consists of urea, making this product perfect for the cultivation of orchids. Peters Professional Grow-Mix can also be used for other crops. Universol Blue is a balanced formula to follow up on Universol Yellow. This product contains NPK, Mg and a full package of trace elements. This balanced formula generates vegetative growth / length development of plants. Peters Professional Plant Finisher is specially designed to give the right nourishment to plants in the final stage of propagation. It contains modified lower phosphate levels and high levels of potassium for compact, controlled growth. Peters Professional Plant Finisher contains extra iron for an optimum leaf color.